Serving every small business client in the way that best suits their needs is a main focus for our firm. We offer training on or management of all of our services including what we offer for social media. If you or members of your staff are charged with managing your brand’s social media presence, we can train you on how to effectively and efficiently use several social media platforms in order to engage with your followers and customers, and strengthen your brand’s social reach. Or if you simply have some social media strategy questions or want help with content planning or crossing a couple other social hurdles, use this hourly service as an open-ended Q&A time. In-person, phone and web conferencing training options available. 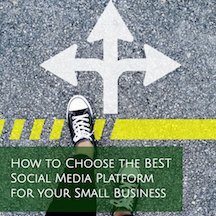 The perfect “in between” for those businesses who want to handle their own social media but who need more guidance and hands-on help than what a “best practices” training provides. Our social media coaching service spans 1-2 months. We start by assessing your current social profiles, content mix and practices, then create a social media plan including a sample content calendar. Three or 4 weeks after you have put your new content strategy in place, we’ll complete our coaching with a review of your updates and a follow-up phone call. There are only so many hours in a day and the thought of adding to your daily To Do list might be more than you want to tackle. All of our social media specialists are well-versed in All Things Social. By hiring us to successfully build and manage your social media presence for you, and create and monitor your paid social media advertising campaigns, you’ll benefit from having an engaged community of relevant followers and fans supporting your brand. Monthly packages available and can include reporting of analytics. Because the social media news feeds have become crowded spaces and every social media platform has its own algorithm, adding in a paid element to your social media strategy is beneficial. Facebook advertising is the most popular format due to Facebook’s plethora of targeting capabilities plus its powerful custom audience opportunities. However, Instagram, Pinterest, Twitter and LinkedIn also offer social media advertising. We can train you on how to create and manage your social media ad campaigns yourself, or we can do your ads work on your behalf.